Living close to Wistman’s Wood, I occasionally find myself thinking about its beauty and its mythical folklore. For centuries, this small woodland has been a draw for walkers, photographers, historians, archaeologists, spiritual-questers, ecologists and the occasional spinner of ghost stories. 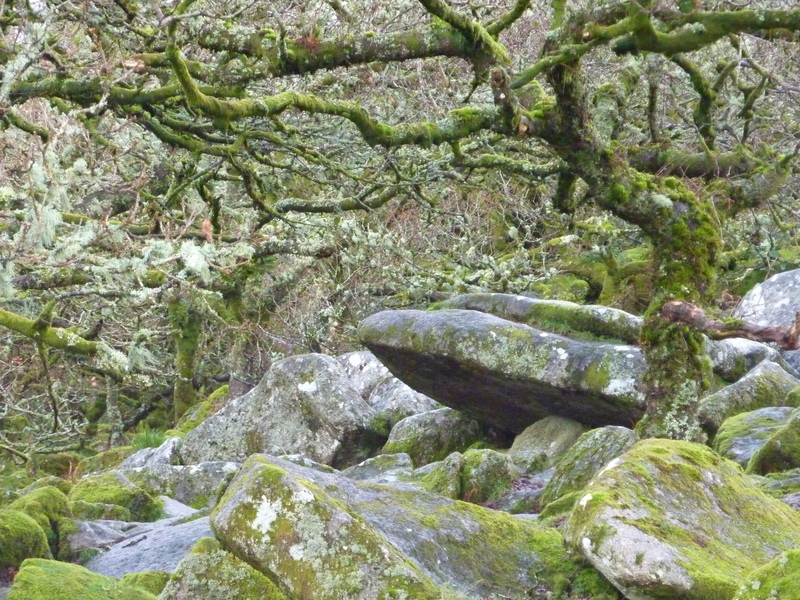 What is it about this unique woodland that inspired the story of Old Crockern, the pagan God of Dartmoor, who is said to keep his Wisht Hounds here? To see this grove of ancient dwarf oak trees is to know there is something otherworldly about them, like a Tolkienesque setting from Lord of The Rings. The trees grow from between huge granite boulders that are covered with such a variety of mosses and lichens that any ecologist might jump for joy. Yet, there is also tranquility amidst the vibrant bird and insect life, which live among the dripping moss and lichen. Each of the trees has an arthritic look with gnarled, stunted branches reaching in all directions. Serene and spooky both come to mind. For centuries these woods have appeared in poems, stories, scientific descriptions, words of praise for their beauty, and some words of contempt for the struggle of walking through them. Deep within the wood, Natural England, has cordoned off a section and the plant growth has been untouched since 1965, a year after Wistman’s Wood was designated a Site of Special Scientific Interest. When bramble, wild honeysuckle, Bilberry, grasses, ivies, ferns, mosses and the like are left to grow without being walked over or grazed, the boulders become invisible. It is easy to see why someone from centuries ago would view these woods with some fear and also as an ankle-breaking impasse. One day, I encountered a professional landscape photographer who had spent hours up on the moor photographing Wistman’s Woods. 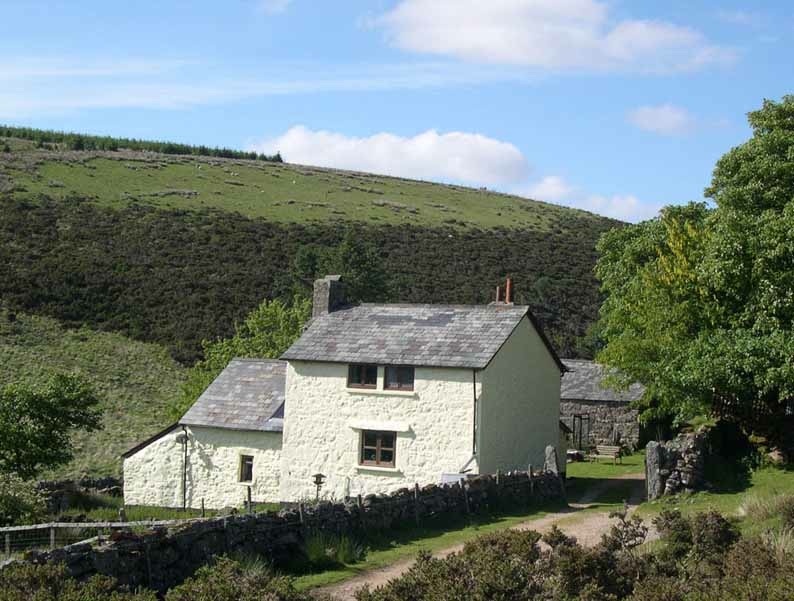 We started up a conversation and he asked me about living so close to the woods, “So you are either very brave or simply don’t believe any of the stories about Wistman’s Wood, which is it?” Hmmmmmm…..Am I? Do I? What exactly are these stories? Druids, apparitions, pixies, fairies, the Devil and a host of other supernatural creatures abound in the stories based in these trees. I recently read that the woods were once described as being among the most haunted places in Dartmoor. That notion is aided by the fact that near the northern edge of Wistman’s Wood is the Lych Way, an ancient track known also as “Way of the Dead.” Historically, it was along this track that corpses were carried for burial in nearby Lydford. Occasionally, a modern report will tell of seeing a ghostly procession of men dressed in white walking past the woods. A bit like sighting Big Foot. It is often said that amongst the boulders in Wistman’s Wood one will find nests of adders, larger and more dangerous than any other in Britain. And of course, it is the home of the Wisht Hounds — that pack of fearful hellhounds who hunt down lost hikers across the moors at night upon their release from Old Crockern himself. Throughout the world one can find tales of wild huntsmen, those strong, menacing riders who gallop across the land, hunting their prey without mercy. 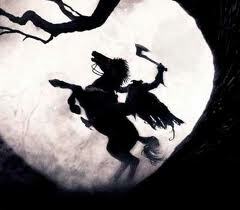 I’m reminded of Washington Irving’s The Legend of Sleepy Hollow with its late night ride of the Headless Horseman. Any of these stories, with the sounds of approaching hooves carrying a hunter accompanied by his pack of hounds, provoke a spine shiver and impulse that I should high-tail it if I hope to keep my life and very soul intact! We are not superstitious types. But early one morning, around 5:30 a.m., I awoke to the sound of horses’ hoofs thundering past the house. Or so I thought. In my sleepy state, I wasn’t certain that I hadn’t dreamt it. As I continued to struggle between sleep and wakefulness, howling in the distance startled me, giving rise to a feeling that something evil was about to happen. “Beware the moon, lads and keep to the road,” is the warning given to two American college students backpacking across the Yorkshire moors by locals having a pint in The Slaughtered Lamb. In this cult classic, American Werewolf in London, the two soon find themselves wandering off the road onto the moors when they hear a spine tingling howling. Am I watching the movie bits in my dreams, or have I actually heard something? In my early morning daze, this movie moment is no longer set in Yorkshire, but instead, right behind our farmhouse. I’m still not fully awake, but my mind is racing, as the howling gets steadily closer: Could these be the Wisht Hounds? Is Old Crockern, astride his skeletal horse, hunting down some lost Duke of Edinburgh competitors? Even early riser Sam is now reluctant to head out for a walk. There are characters in any horror film who irreverently ignore advice and promptly pay the consequences. Keeping with this tradition, I head out onto the moors — dressed in my pajamas and wellies — to investigate. Through the morning mist I see nothing, but continue to hear sounds of dogs howling, barking and from some distance, a lone voice calling, “Loooooooooooooo-in.” It makes for a haunting atmosphere and my general sense of foreboding is growing. In no time, my nerves have gotten the better of me, and I turn to head back towards the safety of our house whereupon I stumble into Roger and Sam who have come to help investigate. “Yo hote, yo hote, yut, yut, yut.” “Looooo-in.” Eerily these sounds echo around the valley. From behind the trees, there is an answer; “Taaaaaaa-Leo.” As the three of us climb the hill back onto the moors, we see in the distance a rider on a horse. What exactly is going on? More howls of dogs, another call of “ta-leo”. Surely, this can’t be the spectral figure of Old Crockern himself since the rider is wearing Tweeds and talking on his mobile phone. Fox hunting goes back centuries and has an equal mix of supporters and critics. Apparently, the organization of a hunt is not just a few horse enthusiasts getting together to dress up and chase foxes, but a highly organized and expensive operation with strict rules. Numerous people, horses, and dozens of hounds are often involved. 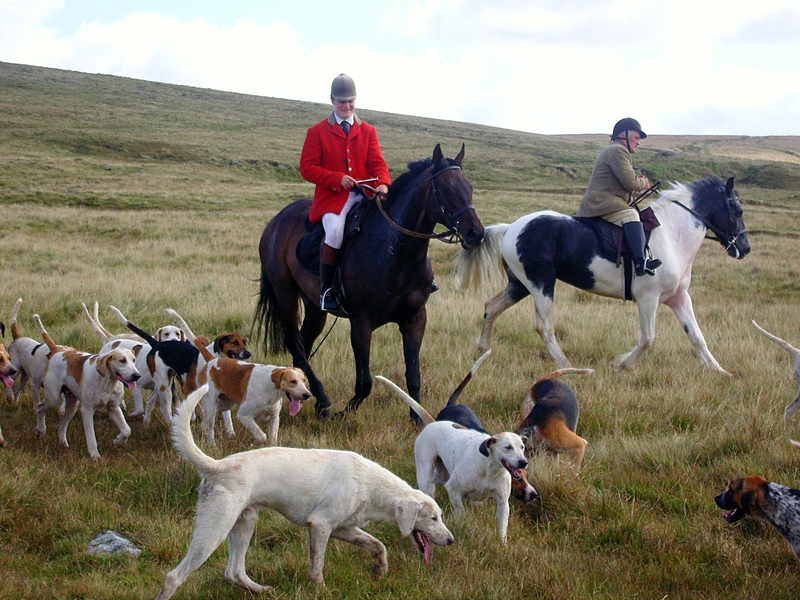 Hunts are to follow rules of etiquette designed to respect crops, livestock, fences, and hedges. Autumn hunting can start early in the morning, but I’m guessing there are no rules about disrupting our sleep. “Looooooo-in!” calls the hunter with one of the many special calls used to communicate between hound and master. The hounds continue to howl and bark. As we make our way back to the house, we realize that there was nothing more to our morning panic than a traditional hunt. Did our close proximity to an enigmatic place get the better of us? 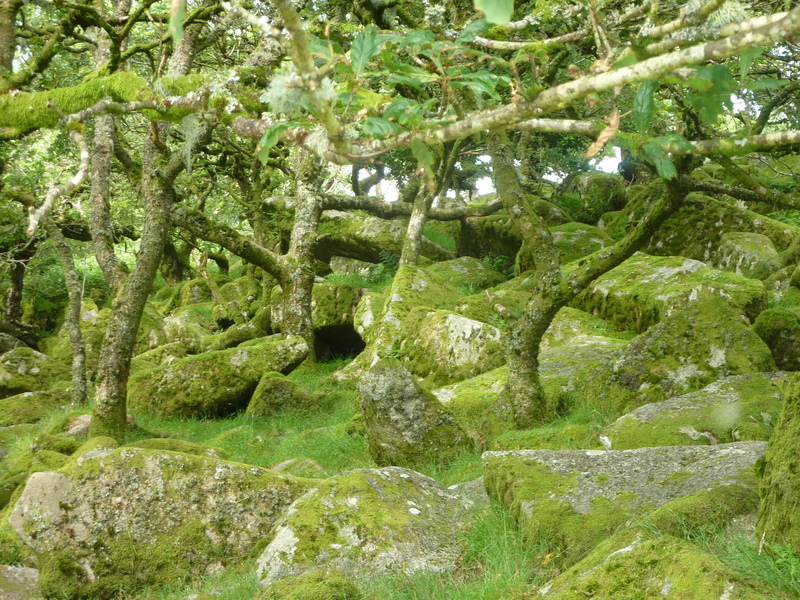 Wistman’s Wood has survived in a hard landscape for centuries, despite agricultural clearances and grazing. Many will continue to promote woodland spirits and mystical energies that protect the trees. One thing is certain though, without the boulders scattered across the hillside these ancient trees would likely not have survived. And, neither would the tales. Would you like an e-mail when I post something new? I'm guessing that would be yes....go on, press follow. Or, you may find what you’re looking for among theses topics.